Person Responsible: Yan Ropert-Coudert et al. 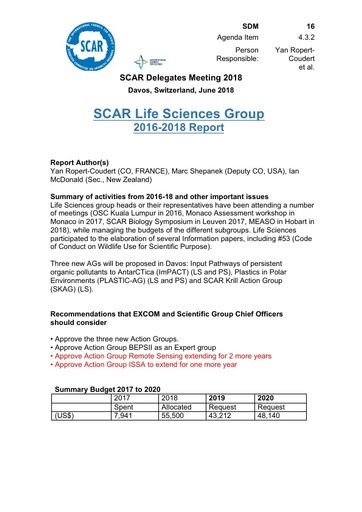 Life Sciences group heads or their representatives have been attending a number of meetings (OSC Kuala Lumpur in 2016, Monaco Assessment workshop in Monaco in 2017, SCAR Biology Symposium in Leuven 2017, MEASO in Hobart in 2018), while managing the budgets of the different subgroups. Life Sciences participated to the elaboration of several Information papers, including #53 (Code of Conduct on Wildlife Use for Scientific Purpose). Three new AGs will be proposed in Davos: Input Pathways of persistent organic pollutants to AntarCTica (ImPACT) (LS and PS), Plastics in Polar Environments (PLASTIC-AG) (LS and PS) and SCAR Krill Action Group (SKAG) (LS). • Approve the three new Action Groups.